Ruta Verde is a tour agency based in the Bolivian tropical city of Santa Cruz de la Sierra. The company was founded by a Dutch-Bolivian couple who wanted to share the beautiful Bolivian treasures with the rest of the world. Since 2006 we offer a great variety of tours with Dutch efficiency. Whatever your interests may be, we can provide you with a personalized trip you will never forget. We offer nature, adventure- and culture based excursions in one of the most beautiful, diverse, and fascinating countries in the world: Bolivia! Please check the tours section in our webpage for a complete list of our tours. We offer fast and friendly assistance starting from the minute you first contact us. We speak English, Dutch and Spanish. We love our work and it shows through our guests’ comments. We are recommended in the latest editions of the travel guides Lonely Planet, Rough Guide, Footprint, Routard and The Amazon. Check our positive reviews on Tripadvisor. 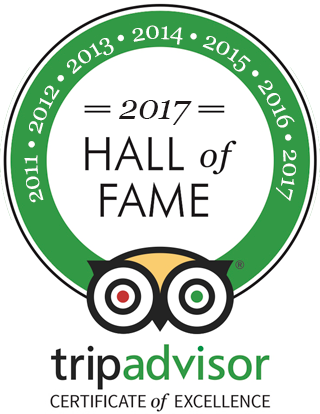 In 2017, for the 7th year in a row, we received our certificate of excellence from Tripadvisor. It shows our dedication and attention to detail in maintaining high quality tours year after year since 2006. Our office is located in the centre of Santa Cruz and very easy to reach. However we suggest to contact us by e-mail so we can guarantee availability. We love Bolivia and value the opportunity of showing it to you. We work hard to make sure you return home with wonderful memories of Bolivia. We work with many local communities throughout the country and celebrate the fact they get involved, and therefore, benefit from the tourism development. We are careful to ensure that local staff receives a fair rate for their services. We are an animal-friendly tour operator. Tourism has the potential to destroy wildlife communities or to save them. Make sure you are doing the latter.